Five years ago, Taylor messed up badly at her lake house in the Poconos and avoided going back. But when her father is diagnosed with pancreatic cancer, her family decides to visit the lake house one last time. Morgan Matson’s Second Chance Summer recounts a story of friendship and love when times are tough. When it comes to fight or flight, Taylor always runs away. But taking the easy way out has its consequences, and she realizes this as she revisits her lake house. Her ex that she dated when she was twelve was still there, along with her old best friend. Can Taylor fix the problems that she created five years ago when she was twelve? The story also has another issue; Taylor’s dad. He is slowly dying and the doctors can’t do anything about it. She has to make the most of her summer because “‘My [Taylor’s] dad’s sick,’ I said. Immediately after I said it, I could feel my eyes prick with tears, and my bottom lip start to shake. ‘He’s not going to get better,’ I said, making myself go on, and sparing Henry having to ask. ‘That’s the real reason-’ My voice caught in my throat and I looked down at my feet in the water, forcing myself to get through it. ‘The real reason we’re up here. To have a last summer.’” Throughout the entire book Taylor learns what it means to love somebody. 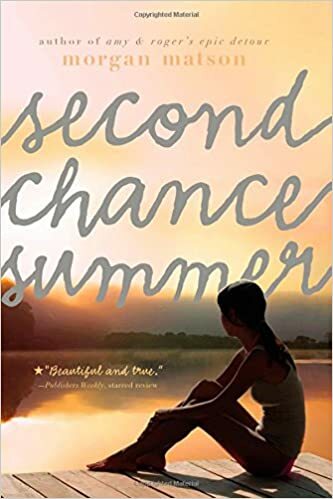 Second Chance Summer by Morgan Matson is a story that is heartwarming and melancholy. All of the social and emotional problems that Taylor has to go through helps to sustain the plot of the story. I like how the book doesn’t say how she messed up right at the beginning, but how it kept alternating between the present and five summers ago. However, this could be kind of confusing because it never says when it changes back to the present. I learned how to make the most of hard times. Second Chance Summer is the book for anyone who wants to read a sad, romantic novel. This is truly a great book and I just want to read more of it.